Martin will present a "Dinosaurs After Dark" talk at the Fernbank Museum at 7 pm on June 26. He'll discuss both "Jurassic World" and the original "Jurassic Park," including answering questions about scientific fact and Hollywood fiction. 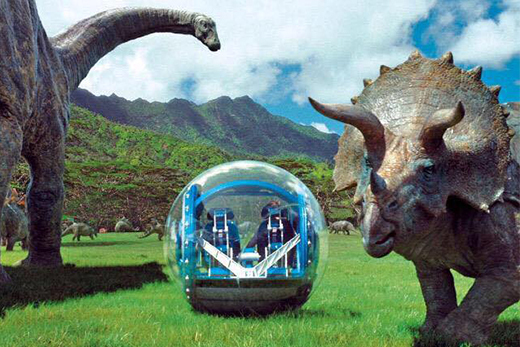 "Like many moviegoers this summer, I plan to watch Jurassic World. And because I’m a paleontologist, I’ll cheer for the movie’s protagonists (the dinosaurs) and jeer at the villains (the humans). "But no matter how thrilling this movie may be, one question will plague me throughout: Where are the dung beetles? "Dung beetles—which are beetles that eat and breed in dung—would be only one of many ecological necessities for an actual Jurassic World-style theme park. "Yes, cloning long-extinct dinosaurs is impossible. But even if dinosaur genomes were available, the animals couldn’t simply be plopped anywhere. "So for the sake of argument, let’s say an extremely wealthy corporation did manage to create a diverse bunch of dinosaurs in a laboratory. The next step in building a Mesozoic version of Busch Gardens would be figuring out how to recreate—and maintain—the dinosaurs' ecosystems."